Tipard DVD to iPhone Converter has the ability to convert any DVD to MP4, MOV, M4A etc video/audio format for iPhone with super fast speed and perfect quality. 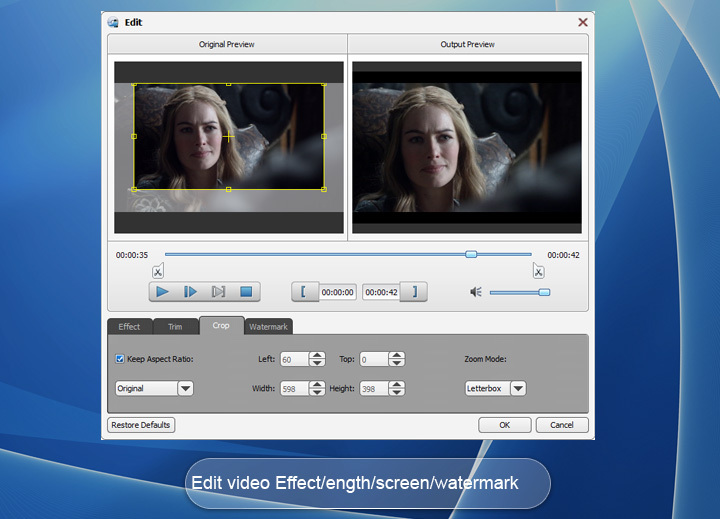 You can customize the DVD with multiple editing functions, like adding pictures and words to the DVD movie and more. The flexible output settings can help you get best video effect. Why Choose Tipard DVD to iPhone Converter? It is designed for iPhone fans to convert any latest DVD movies to iPhone compatible video and audio formats. The conversion speed is super fast because of the advanced NVIDIA® CUDA™ and AMD APP technology. This DVD iPhone converting software has the ability to convert DVD to iPhone supporting formats. You can load DVD-Video, DVD folder, as well as DVD IFO file. With this converter you can convert almost all DVD to iPhone compatible formats, such as convert DVD to MPEG4, H.264, M4V, MOV video, etc for playback on your iPhone. With its multiple output formats, this converting software can support many fashionable devices, like iPhone XS/XS Max/XR/X, iPhone 8/8 Plus, iPhone 7/7 Plus, iPhone 6/6 Plus, iPad Pro, iPad mini 2, iPad mini, iPod touch, iPod nano 7, and so on. 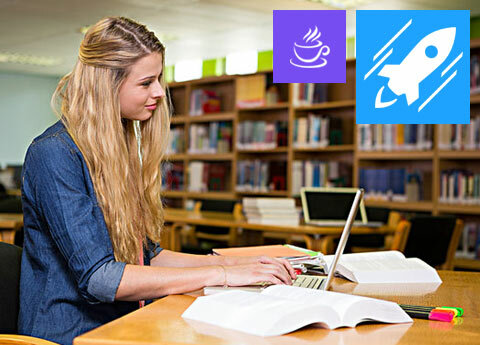 Beyond that, you are allowed to extract your favorite audio from the DVD, and convert it to iPhone supported audio formats such as MP3, AAC, WAV, etc. With "Effect" function on the menu bar of DVD to iPhone Movie Converter, you can get ideal video visual effect by adjusting Brightness, Contrast, Saturation, Hue and Volume as you need. Also, you are allowed to check "Deinterlacing" box to convert the interlaced video to a progressive one. "Trim" function allows you to clip any segment from target video by setting the start and end time. There are four ways to choose to help you select perfect aspect ratio, including Auto, 16:9 and 4:3, and you can customize it. In addition, you can also set specific distances of screen Top, Bottom, Left and Right from corresponding borders respectively. 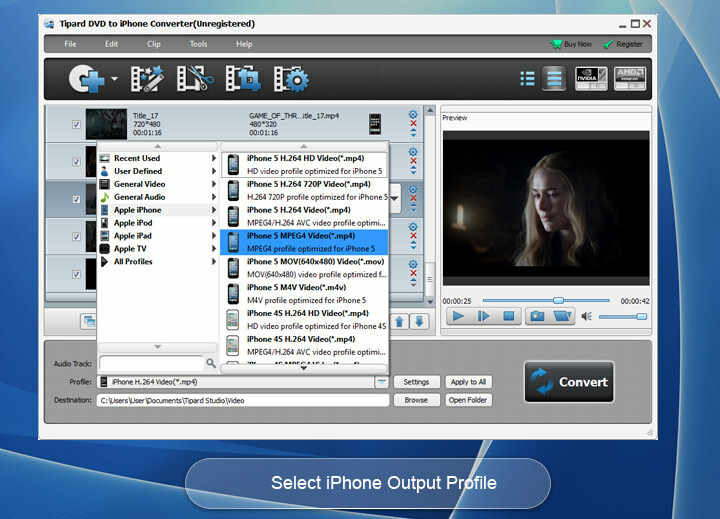 This DVD to iPhone Converter enables you to add a text or image watermark to your video to create personalized video. You are allowed to adjust more detailed video and audio settings by this DVD to iPhone Converter, such as set video Encoder, Frame Rate, Video Bitrate to get customized video quality. And you can set Audio Encoder, Sample Rate, Channel, Audio Bitrate according to your preference. You are capable of inputting you need video Resolution in the form of Width (pixels)*Height (pixels), at the same time, all those settings can be saved as user-defined profile. Tipard DVD to iPhone Conversion Program allows you to choose what you want, audio track and subtitle, or choose no subtitle based on your needs. It offers you abundant profiles for you to choose for the output video. The intuitive interface of Tipard DVD to iPhone Converter makes the operation so easy that even beginners can finish the operation with only a few clicks by following introductions. There is a built-in player, which assist you to preview the source DVD video and output video at the same time. Thus, you can see the converted video effect more clearly. Tipatd DVD to iPhone Converter provides you with a function of upgrading. So once connected the Internet, your computer will detect automatically if there are upgrade information. Therefore, you have the chance to choose the upgrading date (every day/week/month) you need. This DVD to iPhone Converter can help you convert one DVD file to different formats with only one conversion. Tipard adopted NVIDIA® CUDA™ technology can totally accelerate your PC GPU, so as to finish your converting task with ultra-high speed. You can change the name of your output files. It is up to individual preference and need. As a player to preview DVD video before you convert it to entertain on your iPhone. Rachel: I love this software. It can help me to convert DVD to iPhone compatible formats in a fast and easy way. It is really nice software. I will recommend it to my friends. Daniel: Nice program. It is very easy to use and it converts my DVDs to iPhone with good quality. I am also able to capture and save the pictures I like. 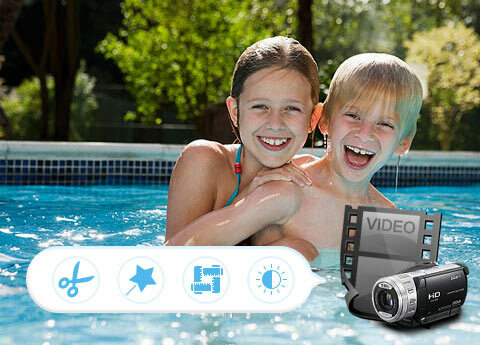 Convert any DVD to 2D/3D video format with fast speed and high quality and edit 2D/3D video effect. Transfer DVD, video, audio, image, podcast, TVshow, contact, sms, etc between iPhone and PC/iTunes.